The Maryland Building Performance Standards (MBPS) apply to all private residential and commercial construction in Maryland except for state-owned buildings and modular and industrialized construction. They incorporate the triennial code editions published by the International Code Council (ICC), including by reference the International Building Code (IBC), the International Residential Code (IRC), and the International Energy Conservation Code (IECC). As Maryland is a home rule state, each of its 57 local jurisdictions may modify these codes to suit local conditions. The energy and accessibility codes, however, are exempt from home rule, and municipalities may only amend those codes to be more stringent than the MBPS. These exceptions include the IECC and the energy efficiency chapter (Chapter 13) of the IBC. The energy efficiency chapter (Chapter 11) of the IRC has been deleted and replaced with a reference to the IECC. Local jurisdictions are expected to adopt and implement their amendments to the current MBPS within six months of adoption by DHCD. Enforcement of the MBPS shall be the responsibility of the local jurisdiction in which the building or structure is located. Regulatory: Updates to the MBPS and MPC proceed through the rulemaking authority of the Maryland Department of Housing and Community Development (DHCD) Codes Administration. Public notice, public hearings, and a public comment period are all required before a new rule updating the codes can be published in the Maryland Register. Enforcement of the MBPS is the responsibility of the local jurisdiction where the building or structure is located. Energy and accessibility codes are exempt from the state’s home rule provisions; municipalities may only implement amendments that increase code stringency. Local jurisdictions are expected to adopt and implement any amendments to the current MBPS within six months of DHCD adoption. Per Senate Bill 625, passed in May 2009, the DHCD must update the MBPS to incorporate the latest applicable I-codes within 12 months of publication of the new code editions. The 2015 MBPS references the 2015 International Building code, 2015 International Residential Code for One- and Two-Family Dwellings, and 2015 International Energy Conservation Code as modified by the Department. The updated editions of International Mechanical Code and International Plumbing Code are also included. The 2012 MBPS now references the 2012 I-codes, including the 2012 IECC, for all new and renovated residential and commercial buildings. This update also applies to the 2012 MPC, which covers state-owned construction and industrialized/modular construction. This update makes Maryland the first state to adopt the 2012 IECC. Local jurisdictions are expected to adopt and implement their amendments to the current MBPS within six months of adoption by DHCD, or around July 1, 2012. House Bill 972 passes, approving the 2012 International Green Construction Code (IgCC) for adoption by all local jurisdictions across the state. It allows local jurisdictions to adopt and amend the IgCC as an optional code in addition to the mandatory MBPS, if DHCD chooses not to adopt the IgCC as an optional additional code. Though Rhode Island has previously passed legislation concerning the IgCC, HB 972 makes Maryland the first state to incorporate the IgCC on a large scale ahead of the final 2012 hearings later in 2011. The enactment date of March 2012 targets the launch of the fully-vetted 2012 version of the IgCC. Governor Martin O’Malley signs HB 972 into law on May 11th. The 2010 MBPS incorporates by reference the 2009 editions of the International Building Code (IBC), the International Residential Code (IRC), and the International Energy Conservation Code (IECC) with modifications by the state. 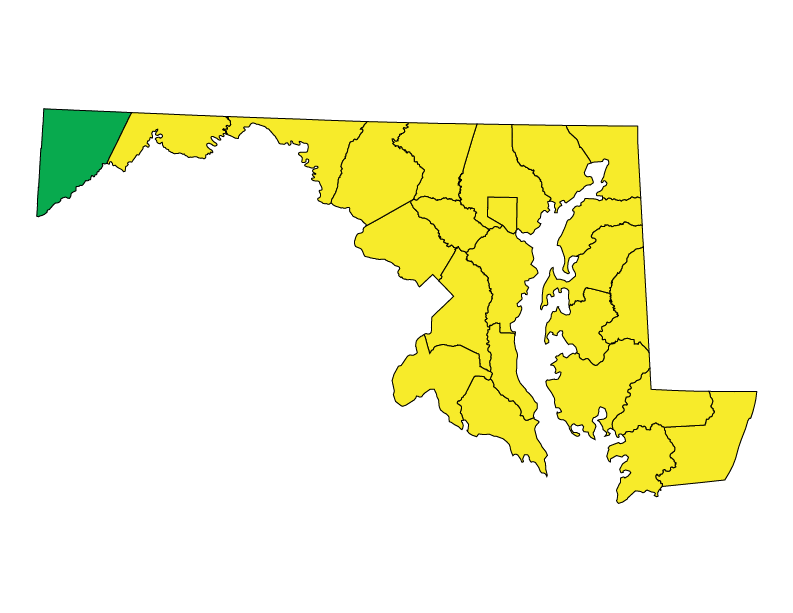 Each local jurisdiction in Maryland may modify these codes to suit local conditions with exception to the 2009 IECC and the energy efficiency chapter (Chapter 13) of the 2009 IBC, which can be made more stringent but not less by the local jurisdictions. The energy efficiency chapter (Chapter 11) of the 2009 IRC is been deleted and replaced with a reference to the 2009 IECC. Senate Bill 625 passes, requiring DHCD to update the MBPS to incorporate the latest applicable ICC codes within 12 months of publication of the new code editions. The next code iteration, the 2007 MBPS, becomes effective. The state adopts (with modifications), the 2006 editions of the International Building Code (IBC), the International Residential Code (IRC), and the International Energy Conservation Code (IECC). The 2004 MBPS, based on the 2003 IBC (including Chapter 13 Energy Efficiency), becomes effective. Maryland passes the Energy Conservation Building Standards Act, which establishes the Maryland Building Performance Standards (MBPS – COMAR 05.02.07). These standards apply to all new and renovated residential and commercial buildings. The Maryland Model Performance Code (MPC), also introduced during this time, covers state-owned construction and industrialized/modular construction. The Act establishes a limited role for the Maryland Department of Housing and Community Development (DHCD). The Act also grants them rulemaking authority to amend the MBPS through publications in the Maryland Register and subsequent hearings on administrative actions.